Everybody knows that FC United is all about community spirit, read more here (MEN). top of the league-build footage -and kit it out! Well things are going rather well on the pitch -in fact as you may know 10 straight wins sees FC sitting pretty at the top of the Northern Premier league and we hope to see us continue with today’s visit of Matlock. Exciting times as ever with this club -YOU and I OWN!! I’m on the top of the world! In early February not even the very optimistic FC supporters expect a finish higher than reaching a play-off spot like the last three seasons, which would been fantastic, too. After 28 games, FC were 10th of the Northern Premier Division with 47 points and a couple of games in hand to some of the other clubs. But Chorley had one game in hand comparing to FC as well as 13 points more and a better goal difference of 15. 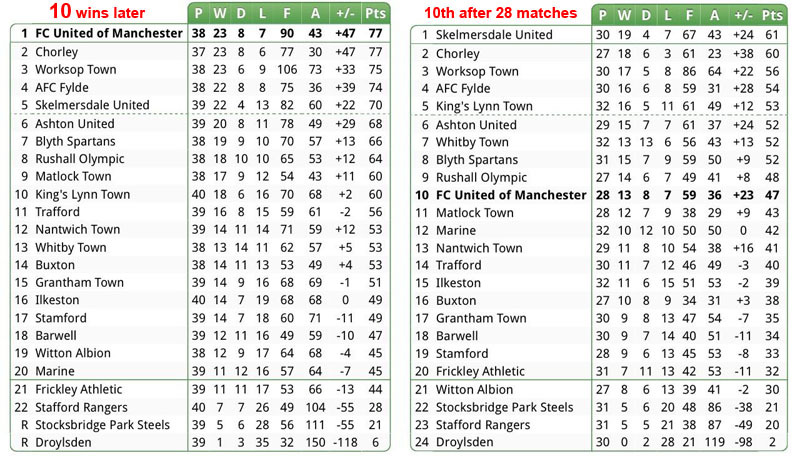 Fairly saying, Chorley has a game in hand and with at least a draw in tonights match, they move to the top again. Nevertheless if Margy’s boys keep playing that good in the last eight matches, the dream of direct promotion to the Conference could become true. What an achievement so far this season as I cannot remember that FC United were on top of the league in mid-season or even at a end of the season stage since they are playing in the 7th tier of English Football. In addition with the community achievement by building their own ground, this season is already a remarkable milestone of FC’s club history! I last posted on the 5th March and I’m delighted to say we have now won 8 consecutive matches-putting us in 3rd position and actually in with a slim chance of automatic promotion. Our game last night was another action packed affair with two cracking goals to seal it. We had the usual fantastic vocal support with the addition of several fans of Athletic Bilbao who are currently working in Manchester who joined in enthusiastically and even added a chant to our immense song book!! Work on the stadium still moves on and the steel for the mainstand is 2/3 complete! More updates over the coming weeks of what has turned out to be a momentous 9th season for FC. So this week the whole atmosphere around the club seems to of been supercharged by events both on and off the field. Then last night between 7-800 FC fans including myself made the 50km journey north to top of the league Chorley. It was a very tough encounter and both teams had chances -but our players grit and determination alongside our new found formation of 3-5-2 -paid handsome dividends with a tremendous injury time goal by Tom Greaves. All hell broke loose for a minute or so with what we Mancunians like to call first class “Goonage” or wild celebrations. The result means a play off place is firmly in our grasp if we can maintain of 5 match winning streak a few games further. Clip courtesy of Neilboo -there is poor quality singing and fruity language -be warned! So we look forward once again to an exciting end of the season -but no predictions from me -it’s bad luck! With the sale of Manchester United to the Glazers, many United fans felt they’d been shut out in the cold and were no longer part of the club we all felt was ours, even though it hadn’t really been “ours” at any stage since its conception. Yes, it is our club in one sense, that we’re the people responsible for its life, but we’re not really – and never have been – the ones who reap any sort of financial reward. That’s always been the guys with the money and we all know much makes more. Louis Edwards made money from United, his son did the same afterwards and the little shareholders after him made a quid or two here and there while the mega shareholders made a lot. I know that as a shareholder myself I wasn’t ever arsed about getting a dividend, I wanted whatever money was made to be ploughed back into the club and I’d rather have seen the best players in the world at the club than people making money off the back of my team’s success. When McManus and Magnier sold their shares to Glazer, it made no difference to you or me. Not one jot, other than what was going on in your or my head at the time. I honestly don’t care if the Glazers are making a shed load of money from the club as long as the team is successful and let’s face it, it has been pretty successful since the Glazers took over. For me though, the best thing to come out of it was the formation of FC United of Manchester; a real football team run by real fans who provide a real atmosphere at the games. My first match was FC’s second competitive game and it was at some shed of a ground that I can’t even remember where (someone will put me straight), and it was fantastic. There were real fans who sang for the whole game! Real fans who stayed right to the very end of the match (unlike the part timers at Old Trafford) and real fans who wanted nothing more than the chance to support their own team that they truly felt part of. Now they are a real determining factor in that team and it is brilliant. There were many knockers from United, and although I’ve never seen or heard the remark from him personally. Fergie was alleged to have said, “Go and support Chelsea,”. If he did he was way wide of the mark. It wasn’t about supporting another team, it was about having control of your own team, the team you love, it was about being in charge of your own team’s decisions and nothing more than that. I hadn’t felt like I was a real part of United for quite a while before the Glazer takeover and prior to that, the whole Rock of Gibraltar thing with Fergie and the two Irish guys detracted from the game and I felt United had either lost or were losing their way a little. What FC United of Manchester did for me was give that little something back. It gave me a sense of purpose with my team. I truly felt part of it and even though I haven’t been for a while ( I now live and work in Saudi Arabia), I still feel part of it. The atmosphere at Gigg Lane knocks the crap out of the Old Trafford crowd who, as previously stated, are more like zombies than proper fans these days. FC has injected life back to football in Manchester and it’s right down there at the bottom, real grass roots football (although some would argue it’s even further down than that), where it counts. As a fan, I don’t think you can go much lower down the league and have that same passion that you can with a team like FC and they demonstrate that with the right will and determination, you can have your own club; you just need the right circumstances and timing to do it. If you’ve never been to an FC game, go. If I’m wrong about the atmosphere and passion, if it isn’t one hundred times better than at Old Trafford, I’ll even give you your money back. Now I can’t say fairer than that, can I? Football is big business and it has been a growing business since Edwards’ days too and if we’re being completely honest here – and we didn’t want “our” club sold – then we fans shouldn’t have sold our shares should we? I know loads of fans who sold out way before Malcolm Glazer took control, so tough luck. I’m just as guilty as anyone when I say we should have acted sooner and bought more shares but as I say, we’re not in a crap position anyway. I don’t think it’s a bad thing that the Glazers are here and it keeps up the “us v them” idea going and that’s always a good thing. It keeps “them” on their toes. And let’s face it, without them, there would be no FC United of Manchester, now would there? I’m signing off from the blogging for about seven months now since I’m heading to Cuba for a long awaited dance trip. There’s been so many things to prepare for the trip so there hasn’t been much activity on my part these last months I’m afraid. But anyhow, I have booked a return flight from Havanna straight to Manchester on the 13th of August so see you all there and hopefully in our own ground! Best of luck and happiness to you all! November’s Bring Your Own Ball is here! Als die Glazer-Familie 2005 Manchester United übernahm, war das für viele Fans der letzte Tropfen, der das Fass zum Überlaufen brachte. Sie gründeten ihren eigenen Klub – nicht um Geld zu verdienen, sondern um Fußball zu spielen und soziale Projekte zu verwirklichen. Geschäftsführer Andy Walsh spricht im Interview über die Geschichte des FC United of Manchester.